Ahimsa, the Sanskrit word for non-harming, is an elemental attribute of the Buddha’s teaching. The concept of “harm,” in and of itself, is not mysterious. It manifests when we needlessly inflict damage, pain, or suffering on any patchwork in the fabric of reality. Later Buddhism codified the notion of saving all sentient beings as an outgrowth of this non-harming. All beings with sentience or consciousness—or to put it in more biological terms, with a spinal column—are able to demonstrate their desire to live their own destinies, their own lives. And this is where Matthieu Ricard, former scientist now an ordained Tibetan monastic, begins his exploration of our relationship with the animal world: if we, not as Buddhists but as a species (a species of animal, in fact), place value on the moral sanctity of life, how do we continue to justify the imprisonment, torture, and murder of billions of fellow sentient beings each and every day? Although Buddhism has long had a stake in these topics, Ricard prosecutes his arguments with a minimum of Buddhist sources, preferring a wider net that takes in the perspectives of biologists, moral philosophers, journalists, and fellow writers. What gets revealed is a millennia-long conversation in the West about what separates humans from the rest of the animal kingdom and what standards, if any, we should adhere to in considering their welfare, on the one hand, and their exploitation on the other. Of the many rich and insightful strands of conversation aired out in Ricard’s book, I was riveted by two in particular. First is the notion that we in the West are all prisoners of a monotheistic inheritance, regardless of how agnostic, atheistic, or modern we consider ourselves to be. That inheritance holds that humans are so vastly superior to all other creatures that, with a few exceptions (our pets, for instance) it is impossible to conceive of “them” as being anything more than fodder to satisfy our cravings. This view either devalues or outright denies the emotional life of animals. Although biologists have widely demonstrated the complementarity of animal and human consciousness amongst a very diverse array of species, the view of divinely granted exceptionalism (Ricard calls it “speciesism”) requires a blind faith. Without that societal blindness—a confluence of marketing, education and common euphemisms—we would all undergo a moral and ethical reckoning that might upend more than just the dinner table. Finally, although he covers a lot of ground in A Plea for the Animals, Ricard has little time for people who argue that plants have feelings, too, and that we therefore should not discriminate between killing a cow and harvesting a head of broccoli. To Ricard, it would seem, this line of reasoning is asinine. If the standard of common morality is sentience, we can still value all life even while we define our terms based on clearly recognizable features of consciousness. To claim otherwise is to hide behind a perverted and self-centered veneer of absolute truth without giving credence to the equally important relative truths of our world. A morality based on this lopsided view can and does lead to a host of disasters, from littering to genocide and everything in between. Our fraught relationship with animals is not easy to look at plainly, but Ricard serves as an excellent, enjoyable and inspiring guide. 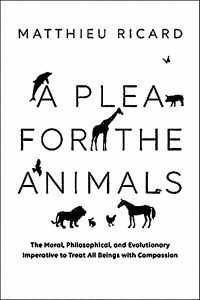 For anyone interested in confronting the facts, philosophical arguments, and even their own deeply held views about animals and the world we share with them, this book will serve as an excellent companion. Click here for a link to the first two chapters of this book. Hokyu JL Aronson, MRO lives at the Monastery in Mount Tremper, NY. He has been a vegan since 1993 except for that one week on the Basque coast in 2008, but we won’t talk about that.